Hareem Farooq has made quite a name for herself in the recent years. She has excelled in dramas, ramp modelling and has starred in movies like Dobara Phir Se, Siyaah and now Parchi. 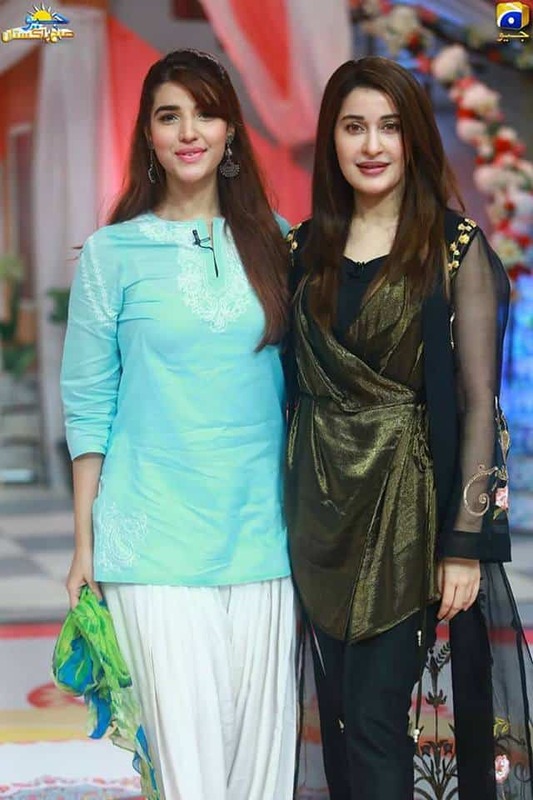 Yesterday, she appeared on Geo Subah Pakistan and got in a candid conversation with Shaista Lodhi. Dressed very casually in a short light blue kurta and loose white pants, Hareem stole the show with her down to earth mannerisms and frank attitude. Hareem spoke of her journey to getting this slim and stylish from the weight of 103 kg that she gained after being bed bound and unable to exercise as she was recovering from an accident. Her tips were to listen to your own body and focus on being healthy and fit for your own self. Her main motivation was the result of her hard work as she saw the scales plummeting and that is how she continued to make efforts for slimming down. Talking about her childhood, she said she was a lazy student who was often absent due to sleeping in on school mornings. Talking about makeup, Hareem revealed that she is not very much into makeup and she believes it does not suit her face very well. On the topic of marriage, Hareem told that her parents have given her full right to choose whomever she chooses to marry, but she would never want to go against their happiness. Their approval is most important for her. Indulging the audience into more details about her personality, Hareem spoke of her intense love for pets and her wishes to go into the direction side of showbiz one day. It was nice to get to know Hareem as a person as she is relatively new and has appeared in a huge number of roles already. Their was one section in which Shaista played to find out the dream man for Hareem by making three hypothetical proposals, which was quite ridiculous, and was made bearable only due to Hareem’s humility and humor.